Filipinos always complain about the corruption in the Philippines. Do you really think corruption is the problem of the Philippines? I do not think so. I strongly believe that the problem is the lack of love for the Philippines. Let me first talk about my country, Korea. It might help you understand my point. After the Korean War, South Korea was one of the poorest countries in the world. Koreans had to start from scratch because the entire country was destroyed after the Korean War, and we had no natural resources. Koreans used to talk about the Philippines, for Filipinos were very rich in Asia. We envy Filipinos. Koreans really wanted to be well off like Filipinos. Many Koreans died of famine. My father's brother also died because of famine. Korean government was very corrupt and is still very corrupt beyond your imagination, but Korea was able to develop dramatically because Koreans really did their best for the common good with their heart burning with patriotism. Koreans did not work just for themselves but also for their neighborhood and country. 40 years ago, President Park took over the government to reform Korea. He tried to borrow money from other countries, but it was not possible to get a loan and attract a foreign investment because the economy situation of South Korea was so bad. Korea had only three factories. So, President Park sent many mine workers and nurses to Germany so that they could send money to Korea to build a factory. They had to go through a horrible experience. In 1964, President Park visited Germany to borrow money. Hundred of Koreans in Germany came to the airport to welcome him and cried there as they saw the President Park. They asked to him, "President, when can we be well off?" That was the only question everyone asked to him. President Park cried with them and promised them that Korea would be well off if everyone works hard for Korea, and the President of Germany got the strong impression on them and lent money to Korea. So, President Park was able to build many factories in Korea. He always asked Koreans to love their country from their heart. Many Korean scientists and engineers in the USA came back to Korea to help developing country because they wanted their country to be well off. Though they received very small salary, they did their best for Korea. They always hoped that their children would live in well off country.My parents always brought me to the places where poor and physically handicapped people live. They wanted me to understand their life and help them. I also worked for Catholic Church when I was in the army. The only thing I learned from Catholic Church was that we have to love our neighborhood. And, I have loved my neighborhood. Have you cried for the Philippines? I have cried for my country several times. I also cried for the Philippines because of so many poor people. I have been to the New Bilibid prison. What made me sad in the prison were the prisoners who do not have any love for their country. They go to mass and work for Church. They pray everyday. However, they do not love the Philippines. I talked to two prisoners at the maximum-security compound, and both of them said that they would leave the Philippines right after they are released from the prison. They said that they would start a new life in other countries and never come back to the Philippines. Many Koreans have a great love for Korea so that we were able to share our wealth with our neighborhood. The owners of factory and company were distributed their profit to their employees fairly so that employees could buy what they needed and saved money for the future and their children. When I was in Korea, I had a very strong faith and wanted to be a priest. However, when I came to the Philippines, I completely lost my faith.I was very confused when I saw many unbelievable situations in thePhilippines. Street kids always make me sad, and I see them everyday. The Philippines is the only Catholic country in Asia, but there are too many poor people here. People go to church every Sunday to pray, but nothing has been changed.My parents came to the Philippines last week and saw this situation. They told me that Korea was much poorer than the present Philippines when they were young. They are so sorry that there are so many beggars and street kids. When we went to Pasangjan, I forced my parents to take a boat because it would fun. However, they were not happy after taking a boat. They said that they would not take the boat again because they were sympathized the boatmen, for the boatmen were very poor and had a small frame. Most of people just took a boat and enjoyed it. But, my parents did not enjoy it because of love for them.My mother who has been working for Catholic Church since I was very young told me that if we just go to mass without changing ourselves, we are not Catholic indeed. Faith should come with action. She added that I have to love Filipinos and do good things for them because all of us are same and have received a great love from God. I want Filipinos to love their neighborhood and country as much as they love God so that the Philippines will be well off. I am sure that love is the keyword, which Filipinos should remember. We cannot change the sinful structure at once. It should start from person. Love must start in everybody, in a small scale and have to grow. A lot of things happen if we open up to love. Let's put away our prejudices and look at our worries with our new eyes. I discover that every person is worthy to be loved. Trust in love, because it makes changes possible. Love changes you and me. It changes people, contexts and relationships.It changes the world. Please love your neighborhood and country. Jesus Christ said that Whatever we do to others we do to Him. In the Philippines, there is God for people who are abused and abandoned. There is God who is crying for love. If you have a child, teach them how to love the Philippines. Teach them why they have to love their neighborhood and country. You already know that God also will be very happy if you love others.That's all I really want to ask you Filipinos. The above commentary has been a floating chain letter for some time in the net. Since I received it for the 4th time, I might as well comment on it. Jaeyoun's observations are good. One can distill some useful thoughts, which though obvious to any thinking and concerned Filipino are virtually ignored by the many, for one reason or another. WHAT WE FILIPINOS SHOULD KNOW: We Filipinos should remind ourselves that: Corruption is just a symptom, not the disease. · On Korean Nationalism. The Korean people have a long and unified history of nation-building or forming of national identity going back 2000 years, where they had kingdoms, faced Chinese and Japanese invasions and occupations; and developed/adopted Confucian and Buddhist thoughts and beliefs. Jumping to modern history, the Koreans were annexed and colonized by the Japanese sometime in 1905 (remember the Russo-Japanese War which the Japanese won, the first time whites were defeated by nonwhites and thus bolstering Japanese pride and nationalism). In 1919 during the Japanese occupation, 31 Korean patriots demonstrated against the Japanese colonial government and proclaimed a Declaration of Independence that touched off a nationwide independence movement that was violently crushed with the death of thousands of Koreans. Just like any colonized country, Korea was exploited by Japan (same way that America exploited the Philippines’ natural resources, trade, etc). Thus, at the end of WW2, Korea was poor but its people were united. They had again suffered and were split during the 1950s Korean War. But with the help of the UN and the USA (because of its geo-economic and political concern about the spread of communism) plus the leadership of a nationalist and strongman/dictator Park Chung-Hee, the already nationalistic South Koreans worked hard and suffered for their country to attain full industrialization and modernity as seen today. They are now working to hopefully unify the country with the North Koreans which seems still difficult right now. · On Filipinos' Lack of Nationalism. We Filipinos and the Philippines do not have much known history before the arrival of the Spanish conquistadores in 1521. Its physical geography explains much about the tribal mentality of its present people. The many islands created many dialects, animosities between “datus”/tribal leaders and tribes, etc. and these differences were used by the Spanish colonists to further maintain and divide the people by pitting them against each other – these for the most part explain our dislike and mistrust for others belonging to another town, province, region, etc. with the resultant lack of national identity/unity. The leaders of business, government, military and the rich, all/most of whom are professed Catholic Christians and can do something about correcting the Filipino predicament, do not seek nor plan to provide the basic necessities of the majority, who are in poverty. Maybe the failure of integration of Christianity among so-called Christian Filipinos is partly due to some bad history made by some churchmen, during the Spanish times and now, wherein these live icons of Jesus Christ were and are more concerned about material things and the church as an institution than as models and teachers of Christian living. I include the aloof and so-called “Praise The Lord”, Bible-toting Protestant fundamentalists whose belief and main drive is personal “salvation” to heavenly rewards --supposedly attained only by direct line to God-- that good works do not buy salvation and thus withdraw from active social concern and involvement, as originally taught by Protestant Reformers such as Martin Luther and John Calvin in the 1500s. · On What WE Filipinos Ought To Do: Corruption indicates the absence of national unity. Filipinos in the Philippines need to put their efforts to re-learn and understand their nationalist history, their hijacked and unfinished nationalistic revolution, therefrom unite and fight for true and nationalistic independence i.e. economic and political. 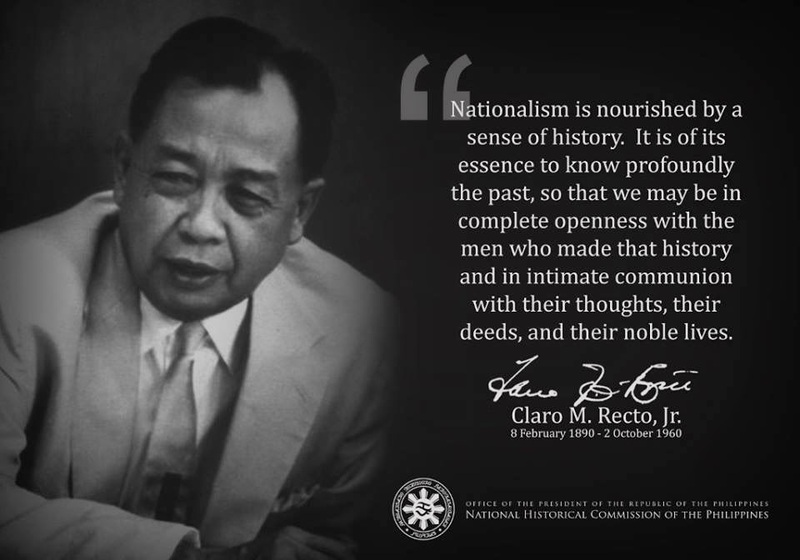 Our nationalist history that has become more remote and meaningless in the minds of the new, younger and globalized (Americanized) generations of Filipinos in the homeland. Corruption also indicates a distorted christianity. Christian Filipinos should do away with much of their childish Catholicism and put more emphasis on being authentic Christians, i.e. living Christ’s teachings on altruism (especially by those who have satisfied their essential human needs and thus able to attend and improve the lot of their poor neighbors). The impoverishment and predicament of the Filipinos in the Philippines --with its resultant degradation and prostitution of Filipino women and children at home and abroad, the early death of the young, the sickness and diseases of many, the export of its workers, the mortgaging of its future generations-- will remain perennial and endless unless so-called christians work on present realities than for a supposed hereafter.